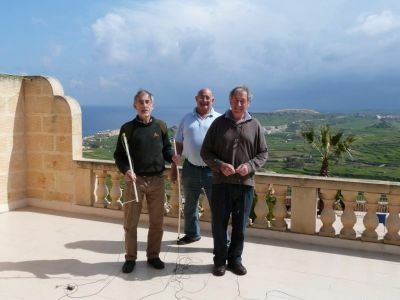 After the enjoyment of Cyprus in 2013 the Addiscombe club, Peter G3SJX+ xyl,Steve G3UFY, Mike G3VYI + xyl looked for a commonwealth trip , and decided to try Malta/Gozo. This had been used to great effect by Peter G3LET, but we had checked and he was heading elsewhere this year. So we hired a suitable looking villa via a villa website , hoping it would be a good high site . Local support is invaluable as we found last year via Norman 5B4AIF, and this year Peter G3LET put us in touch with Colin 9H3CT who was a great sounding board for the villa and site advice , as was Peter himself. Equipment was paired down to my FT857, and homebrew 1/4w verticals using the SOTAbeams 10m pole as a common support, and a second 10m 1/4wave from old vhf beams! Total cost 90 £ and all in a suitcase ! An 80m sloper made from wire was also brought. 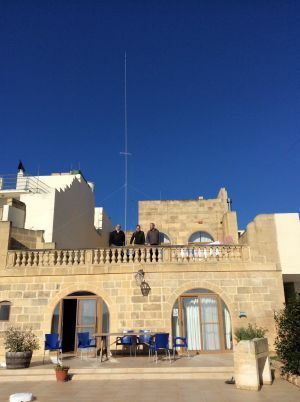 Before the contest we enjoyed a week of holiday style operation, mainly on 10m and 40m, and Gozo sightseeing, and also visiting Colin 9H3CT and his XYL at their home. Geoff 9H3AY also met up with us , he lived a mile from the villa, and was a mine of local info.. The antennas were set up on the villa veranda and roof, with great views to the north and east, but not too good north west, but the villa itself was on a ridge about 100m high. 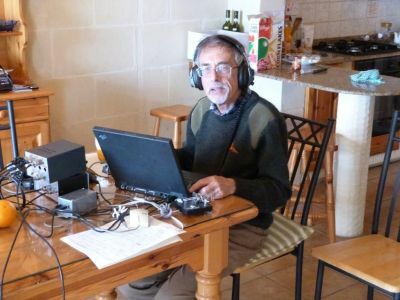 Local HF noise levels were ok, but S8 static rain and thunderstorms did cause some problems before and during the contest. We joined Brian C4Z’s team MED, as multi op is now allowed, the more the merrier! We kicked off on 10m, and found 90w and a 1/4w works fine, BERU is such a unique contest. After an hour we had bettered last year’s rate, making 100. Things carried on like this on 15 and 20m , but in fact we were slipping behind the bonus count, but enjoying the pileups!! After 20 closed 40 went well, then a few on 80m, but after 0200 till 0600 it was more of a struggle with 90w and wires. 10m opened early on sunday and we ran 10 15 20 m till the end. Being multi-op means fatigue is less of a problem, and you can push till the last minute. The FT857 did ok, though there are better receivers, and only 1 dry key lead joint fixed with 10minutes to go caused a panic! There was S9 static rain QRN at times on 20m, and several calls to Africa stations and west coast VE’s failed on 80 and 40 during the night. My cheap cans caused Steve earache! We ended up with 940 ish QSOs, more than last year from C4 with QRO, but fewer bonus’s, maybe due to enjoying the pileups too much!! Again it was great to work BERU from the DX end, but have to learn to find the bonuses bettter!